Our tradition teaches us that when one gives tzedakah, one isn't merely giving his or her money away. On the contrary! When a person gives of hard-earned money to a charity assisting a worthy cause, the donors work and effort become joined up with that worthy cause, and it is as if they are preforming the righteous deeds themselves. We are asking you to be Partners with us as we work to enhance Mississippi's Jewish community. Your donation will help support holiday programs and parties, Torah classes, bar/bat mitzvah lessons, and in general helping us do all we can to increase Jewish life in the "Deep South". 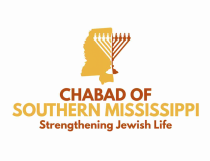 Chabad Lubavitch of Southern Mississippi is entirely supported by local donations, and everything we receive stays in our community. In this merit, may G-d bless you and your family with much health, happiness, and success.